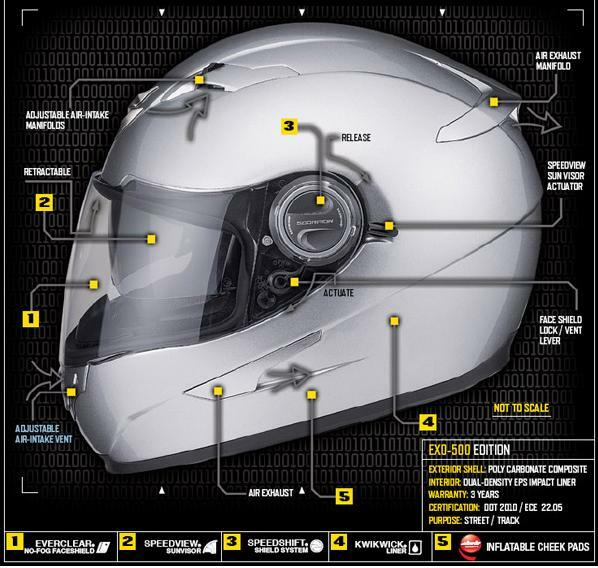 All we know at the moment is that it will be available soon, But as far as "bang for the buck" is concerned for a sub-$200 sport helmet, the Scorpion EXO-500 Helmet will deliver in spades. It builds on a lot of the technologies we have seen in other Scorpion lids, but for a very reasonable price. It will include the AIRFIT pump fitment system as well as a dropdown tinted sun-visor and DOT / ECE cert. The basics by way of liner, shield and anti-fog, which Scorpion does so well, will no doubt be part of the deal. Stay tuned for preorder details, but we think it will be a big hit for the spring.